Most everybody has a visual of folks who are brain dead and the examples which come painfully to mind. 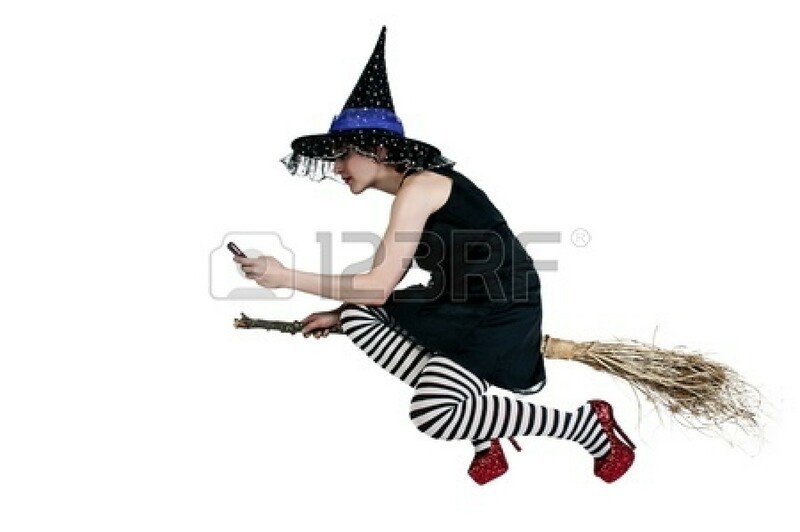 The lady above has her broom on autopilot while her cellphone is the clear center of visual attention. This is about those folks who mingle among us freely, who walk and talk, and appear fully human, but some key dimension of humanity seems to be completely missing. No! I am not an expert on the brain dead, but I have to dodge folks with cellphones in cars on the roads every day. They are not even aware of their hazardous presence in public, or they don’t care. The spark which inspired this paper was from a comment left in response to a webpage called From Poverty to Wealth. For a period of time that page generated hundreds of comments. Each comment requires moderation, which means that to appear following the page the comment must be reviewed and approved. This comment was one of the few to comment on the comments. While including a smiley-face with her response, she asked if most comments were coming from folks who appear to be brain dead? As a student of human behavior, this response struck a resonant chord, and I was unable to sleep at 3:00 in the morning. A cluster of related thoughts come rushing to mind. Most of these thoughts have little to do with insanity as such, but with folks who seem to be, for the moment at least, in a fog, in another world, or on a different planet. Are brain dead folks simply preoccupied, diverted, in escape mode, or is it a more serious lack of connection to the real world? Is it possible for an individual to become so preoccupied with a thing that they lose perspective with what’s going on around them? The answer is clearly yes! One of the more sane replies to this question was from a church bell choir director who explained that being in a bell choir was one of the things that folks get into. Everybody has to have a thing, she said. Expanding on this thought, we may all wish to leave a mark during our journey on earth. Having a thing may be our individual mark, our measure of worth! It is given that a very large number of folks on earth don’t have a thing, and might be far better off if they did. Moving more toward the occult, Oliver Sacks, a neurologist, wrote a book entitled The Man Who Mistook His Wife for a Hat. It was filled with case studies from his practice, and featured those individuals whose perceptions were described in such a bizarre and consistent fashion that it appeared some fundamental connections in the brain were simply missing. The result is folks who see things in their world that are like what no one else sees. Our children often thought of Aunt Edna as a witch, but that was because of her black hats, long sweeping gowns, and cackling laugh. When contemplating folks who are brain dead in a more normal sense of the word, today’s world appears to be fully populated with many who display one preoccupation or another, one thing after another, and a few individuals who focus upon a specific thing with such reverence that they appear to be somewhere else. Plato of Greek fame was known for his catatonic displays remaining motionless for endless periods of time in public. He was seemingly unresponsive to external stimuli. Is it possible that great skills and momentary idiocy may even merge into a single category? While I would like to keep my wife out of this discussion, we have had a life-long, 60+ year disagreement over what happens when an individual multitasks. She assures me that women are outstanding at multitasking, and that the more one multitasks the better. In no respect am I suggesting that my wife suffers from periods of brain death. However, after I purchased an I-phone for her two years ago her talking to me almost stopped, as she most constantly fiddles with her mobile device. This is not to complaint about the new periods of silence, but it is a perfect illustration of a mild form of brain death. On occasion she is so immersed with her busy fingers that my simple utterances fall upon a deathly silence. She could be playing bells, or worse, she often plays video with sound. My response is tied to the belief that the eyes and the brain in each of us can focus on a single thing at a time. When multitasking one task becomes primary, while other simultaneous tasks may be performed very badly, often with serious consequences. I am reminded of a Volkswagen with four college girls driving through Athens, Georgia with the windows rolled up and the radio or conversation the thing of the day. They arrived at an intersection at the same time as an emergency vehicle, and all four were killed. Whatever tasks they were performing, the driver should have been driving, not multitasking. This was before today’s mobile devices. This circumstance is no different from today’s texting while driving. This allows one to “share everything”, as the ad says, with everybody at any time. These menaces on the city streets and highways are reported to be more dangerous than drunk driving! The drunk, at least, is giving driving his best shot. Those texting while driving are watching their devices as they wander all over the road. Texting with mobile devices has become a primary thing for millions of folks around the world. We will never know the extent to which those who text fit nicely into the broad category of brain dead. There is no clearer evidence of this than the woman walking through a city park while texting, and fell face first into a fountain. This is poetic justice for the brain dead, while others may die as a result. Yes, of course, one may multitask, and one of the many tasks will be degraded (rendered unconscious) in the process. The opening picture is a fascinating glimpse of distraction while driving your broom. Just when is the brain actually protecting your body, and when is it blinded by distraction? A partial answer is clear to me, but not so much so to my wife who will critique this paper with a jaundiced eye. In today’s world a great deal of the age-old drudgery has been converted to automation. In communication it is possible to send a message around the world in mere moments. Staying in touch is a piece of cake. But the notion that one should share everything is a multitasking nightmare. This does not keep some folks from trying! They text, they send pictures, they want you to look at their many pictures, and they have voice mail, whatever that is. Increasingly unless it is a text message they don’t bother to respond. How, exactly, do you get the attention of the brain dead before it is too late? Flying airplanes has been automated very nicely. They call it autopilot. The problem with autopilots is they work fine until they fail. Malaysian flight 370 flew the Boeing airplane for many hours with no problem, and probably would be flying still had it not run out of fuel. Many brain dead comments to my web page are exactly of this class. In fact virtually all of these comments have nothing to do with the paper they supposedly reference, but is an automated “cold call” diversion from somebody who has something else on his/her mind. The hundreds of comments to my paper are being sent to me through automation by the brain dead. This happens because there is a free app somewhere out there which can be loaded onto a mobile device, or any other brain dead device. The operator is told that with the app it is possible to compose a one-size-fits-all comment that will make sense to all those with webpages open to comments. When a comment is complete it is put on autopilot. From that point forward it is free to orbit the earth at will exposing it to humans and the brain dead alike. It looks like it is from a live human! After you see the identical brain dead response half a dozen times, it is clear it is no longer emitted by humans, but by some device in orbit around the earth. Brain dead responses are most all on autopilot. The challenge is figuring out which ones have a for-real human driving, and which are not driving at all. Like ivory soap, 99.98% plus are on autopilot, and (all) comments should be eliminated as being a waste of time reading. Are the following comments from brain dead folks, or not?